Do you have a few different devices? Do you need them all to work, all the time? And work together? We can help. Our Desktop support packages are perfect for the small business or home user - where it's important for your devices to be working to their full potential. That means fast, responsive and reliably. Or perhaps you run a small business and want to take your IT to the next level of professionalism? Computers that are covered in the event of a problem, with a guaranteed 4 hour call out. Professional email you can access from any device. Online backup so you know your data is safe. 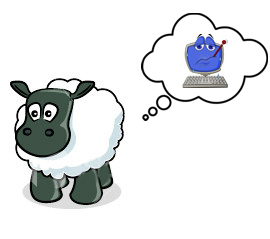 Digital Sheep's desktop support package is perfect for my business - and it covers the laptop we use at home too! With our Silver, Gold and Professional support packages, we promise to be with you within 4 hours of you reporting a problem if we can't fix it remotely. In most cases, we're there faster than that - because we know that every minute of downtime costs you real money. We can ensure that your desktops, laptops and mobiles all have access to the same files - no matter where you are. For example: if you update a document on your computer in the office, by the time you get home that document will be the same on your home laptop. With our professional email systems, your desktop, laptop, tablet and phone can all share the same email, calendar and contacts. That means that if you make an appointment using the computer in your office, it will automatically drop onto your phone and remind you as appropriate. Have a look at our Desktop Support Pricing page.